Modular Farms’ new manufacturing facility will service the Oceanic region. With its HQ’s strategically based in Brisbane, Modular Farms Australia announces it one-of-a-kind indoor farming technology to the Oceanic region, where it will manufacture its state-of-the-art farming systems and modules which are designed for scalability and maximum ‘Return on Investment’. Modular Farms is a turnkey indoor farming system utilizing a combination of industry leading, vertical hydroponic growing technologies. Units are designed and engineered with modular and scalable purpose-built components; outlasting and outperforming competing container farming systems. The purpose-built modular units are 60 per cent better insulated than a farm in a standard shipping container and are fully sealed in a precise controlled environment. Its recirculated air and water, ‘closed-loop’ hydroponic system, inclusive of its climate control features, uses 95 per cent less water than a typical outdoor farm with similar yields. The Primary Module has the capability to grow up to 80 per cent more food than competing container farms or the equivalent of 1.5 acres of broad-acre farming. The result is a high-level product that produces crops quickly, at quantities and qualities exceeding those grown in upcycled shipping containers. The foundational unit, and the first module a farmer will start with. This Module includes 240 8’ ZipGrow Towers, 60 Intravision Spectra Blade’ LEDs, farm automation and a built-in staged climate control system. A climate barrier and connector between modules, allowing farmers to move from one module to the next without stepping out of the farm. Farmers can store extra supplies here or set up a handy office space. 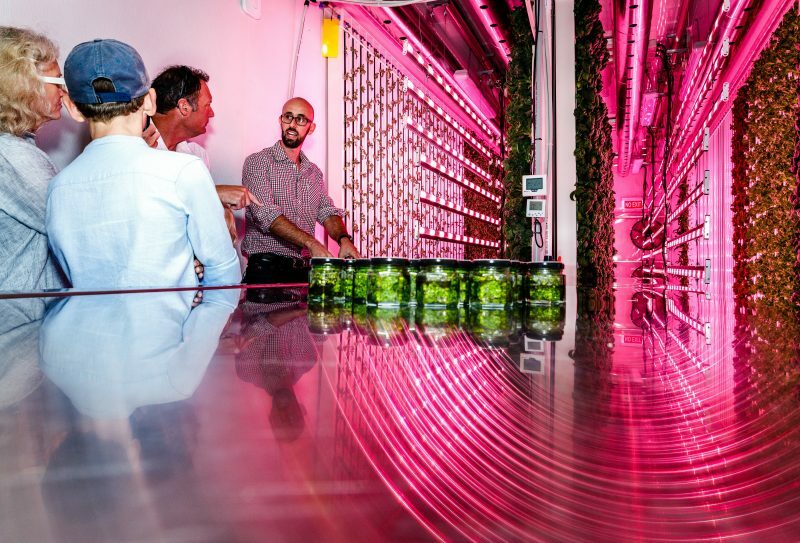 A unit containing 312 wall-to-wall ZipGrow Towers in the same footprint as the Primary Module, meaning farmers can increase growing capabilities by 130 per cent. Leading Modular Farms Co Australia are James and Prue Pateras, who aim to connect with local businesses, entrepreneurs and farmers, including those still recovering from drought. The first showcase Modular Farm is now permanently located at Eat Street Northshore, where it will supply the Northshore precinct and OzHarvest with fresh produce, and provide the opportunity for potential Modular Farmers to see the technology in action. Modular Farms Australia is the first Modular Farming operation outside of North America providing fully engineered units compatible with multiple terrains, weather conditions and a focus on plant health. Each Modular Farms unit is manufactured in Brisbane, Australia. With access to power and water, Modular Farms can grow fresh, healthy produce virtually anywhere in the world and in any climate. Current modules include Primary and Vestibule with the Macro coming soon. The Modular Farms App allows users to monitor and control their farm in real time from their smartphones. By partnering with world-leading experts in LED lighting, plant health sciences and indoor agriculture, Modular Farms Australia brings unprecedented opportunity for expansion and growth in the agricultural industry. To improve upon the first-generation shipping container concept, the research and development was jointly conceived by a team of passionate and diversely educated farmers and engineers, inclusive of Australia’s James Pateras, which resulted in the founding of the technologically advanced Modular Farms Co in Canada in 2015. Its engineered farming units are designed with modularity and scalability in mind, taking Modular Farms to new terrains and markets. Modular farming is suitable for remote and island communities, grocery stores, food services, agribusinesses and educational facilities wanting access to freshly harvested, sustainable food. By doing so Modular Farms reduces food waste and transportation while increasing food security. Visit www.modularfarms.com.au for more information and follow Modular Farms on Facebook, Twitter and Instagram.